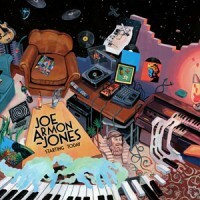 This debut album, by prodigious keys player, composer and producer Joe Armon-Jones, is buoyant, celebratory and welcoming. With a background in jazz, he draws from influences in dub, hip-hop and soul. Different traditions are infused and commingled together. Soulful brass arrangements are coloured with carefully-tuned atmospherics; individual flashes of brilliance are bound into the album’s bigger picture. He’s part of London’s young, jazz-influenced music scene. Drawn from that same close-knit circle, the album features the likes of Moses Boyd, Nubya Garcia and Oscar Jerome. It’s playing with those – along with Ezra Collective, which he co-founded, and touring with the likes of Ata Kak and Pharoahe Monch – which has honed his playing and grown his ideas. It’s made for a record with an unmistakable depth. He draws on deep musical understanding, making music which is warm and has a feeling of joy. A document of his vision for bringing together his different influences, it’s also a testament to hard-earned, head-turning musical virtuosity.